That Christmas Feeling hardback picture book is available now! 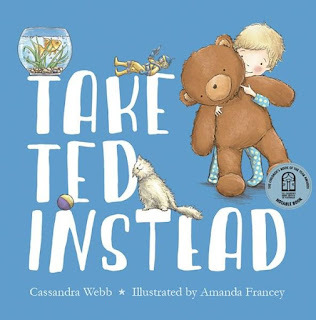 And it's also Happy Publication Day for Take Ted Instead paperback edition. 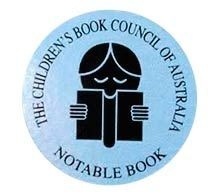 I'm so rapt to see the CBCA Notable Book sticker on the cover! Having a little fun today, making animated gifs of my illustrations in photoshop. Character roughs of the protagonist. 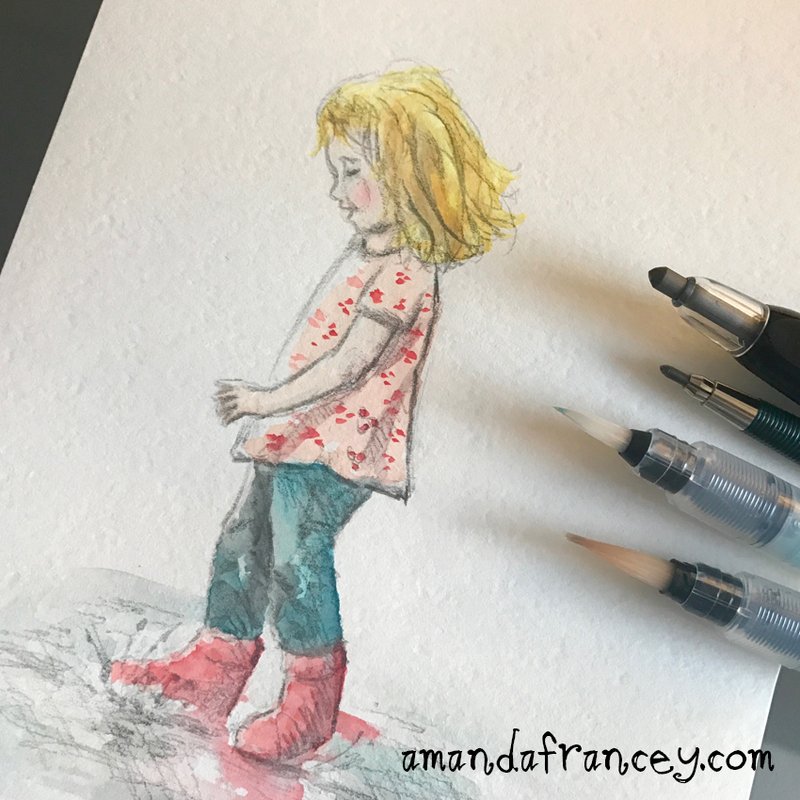 Recently, I started character roughs for an adorable and humorous chapter book coming out in 2018. 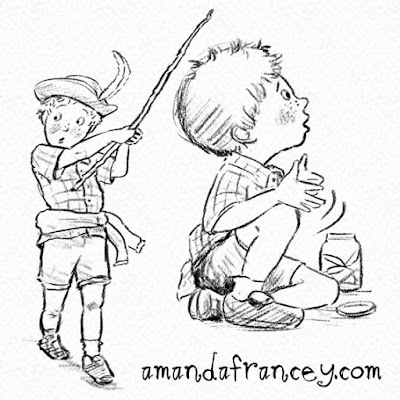 This will be the very first chapter book illustrated by me and it is my very first project with Wombat Books. More will be revealed next year, closer to the release date. Shortly after signing the illustration contract with the lovely Wombat Books, Wolly showed up on my doorstep. 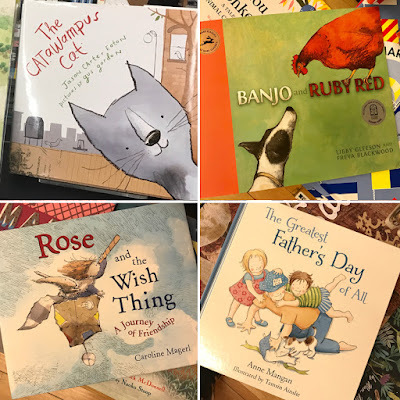 Thank you Wombat Books! 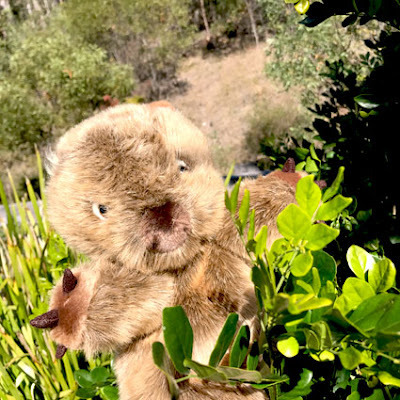 I was really touched by this warm and cuddly welcome into the Wombat Family. Wolly feels right at home. Unfortunately, our dog was a little jealous of all the cuddles Wolly was receiving from our daughter, who was sick with the flu at the time. 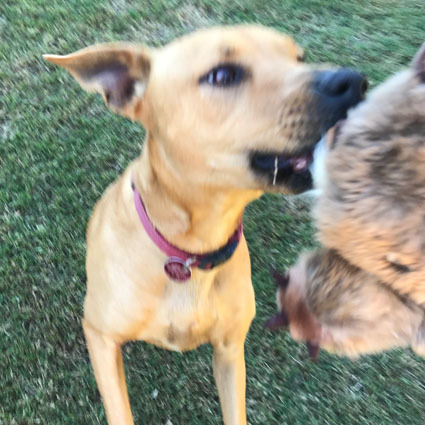 While my daughter left Wolly on the couch because she just had to show me the longest snot string ever, (which was dangling precariously from her nostril to the end of her outstretched arm, holding the tissue), our dog nuzzled the door open and Wombatnapped Wolly! No Wombats were injured in this photo. Meanwhile, my husband was nearly knocked down the stairs by a tan and grey tornado as it whooshed past. Luckily, he managed to rescue poor Wolly before any damage occurred. Wolly teaching our dog a few manners. 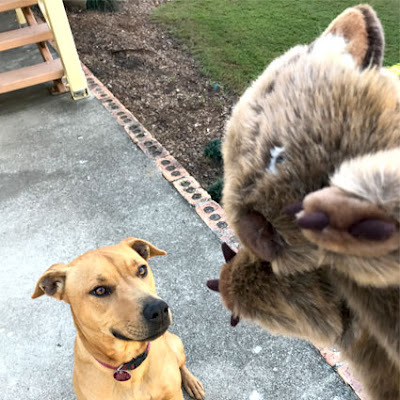 As it turns out, Wolly's quite the bossy little wombat. He's made it very clear that he likes to oversee my work and he tricks me into doing things that I'd rather not do. Like clean up my desk. 'How do you know what colour your desk is under all those papers, folders, books, hats, skipping ropes, chocolate wrappers and sticky notes?' Wolly asked. 'I don't,' I replied. 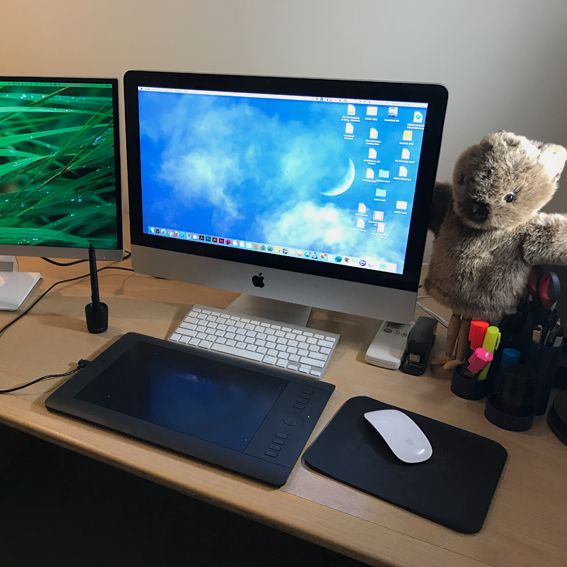 And then I started to wonder what colour my desk was. I had to clean it up. And that stare he gives me while I'm procrastinating on Facebook or Instagram too long. Oh my! What skinny legs you have Wolly. I'm beginning to think Wolly's not a real wombat. That Christmas Feeling is almost here! 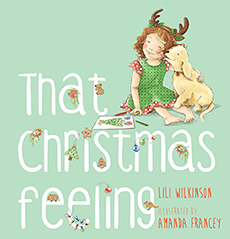 As I mentioned before, I have recently completed illustrating a picture book called, That Christmas Feeling, written by Lili Wilkinson. Allen & Unwin will be releasing this heartwarming Christmas story on the 1st of October 2017. Here's one of my advance copies. I'm so excited!! 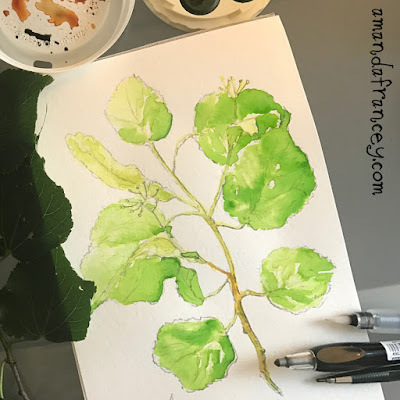 More on this to come.. book launch and other book event details, a video of me illustrating the front cover and a children's Christmas activity... so watch this space! Dottie's brother, Jem, trying to bring a little Christmas magic to Grandma's & Grandpa's. I'm currently illustrating a chapter book (my first) and will post more on this next up! From the balcony of 'The Tides' Glen Haven, overlooking Big Indian Island, Nova Scotia. It’s been a few months since I’ve updated my blog, but I do have a very good reason. 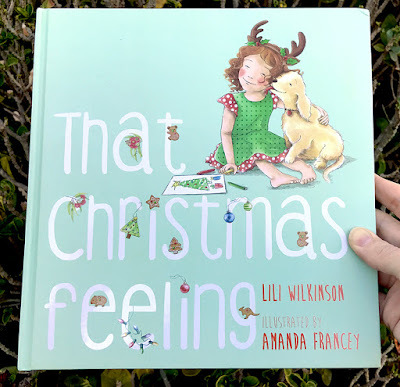 After illustrating my last picture book That Christmas Feeling by Lili Wilkinson, my husband and I decided that our family deserved a long holiday in a faraway place. The greatest highlight for me travelling over 16,000km, was making friends with this 'wild' fox. I spotted him or her (let’s say her) on the side of the road, while driving through the picturesque Anne of Green Gables land on Prince Edward Island, Canada. When I say 'wild' I mean 'semi-rural-maybe-someone's-pet-kind-of-wild'. Three of these photos were taken in some random person's backyard that I trespassed to have a closer look. Wild or not, this was an amazing experience. After some apprehension, she came right up to me! I think she was hungry. 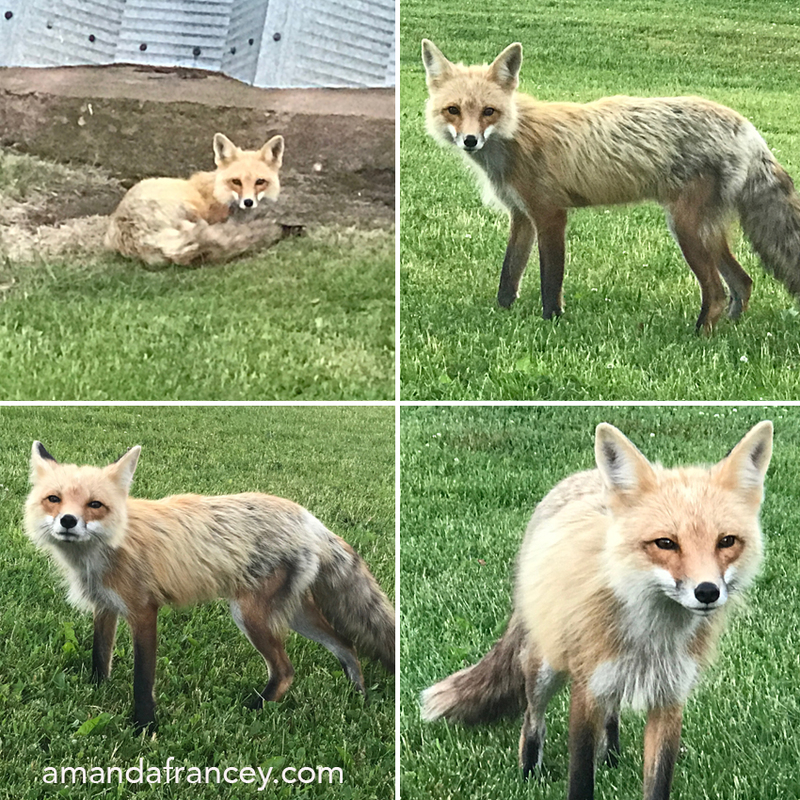 My fox friend from Prince Edward Island. Another highlight for me, was when this doe and fawn trotted by one afternoon. This is the front garden of The Tides, a charming house we stayed in while visiting Nova Scotia. 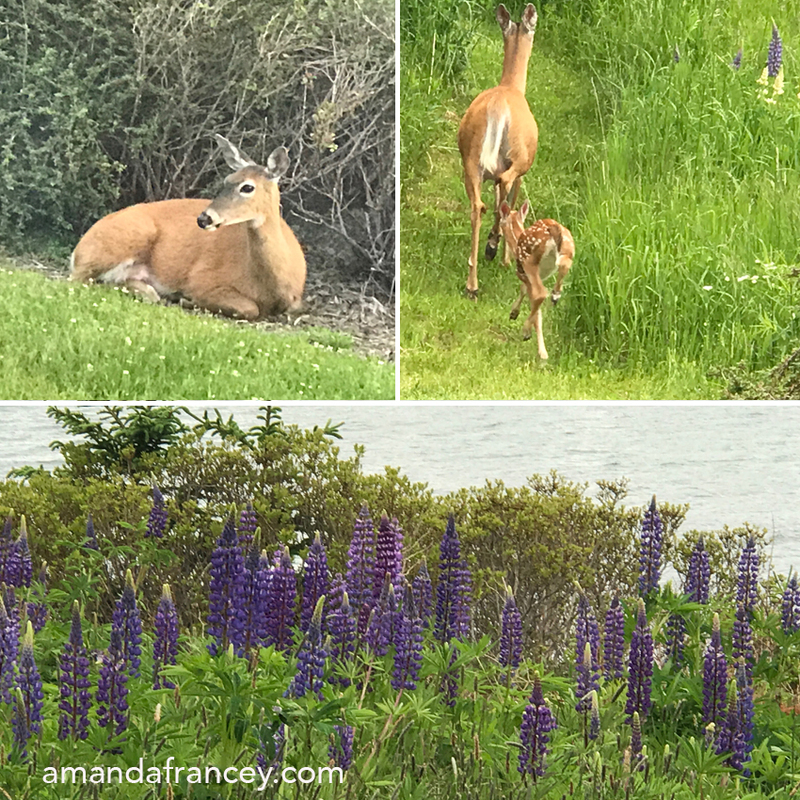 Front garden with deer and purple lupines at 'The Tides' Glen Haven. I asked the doe and fawn to pose for me, but they were a little shy and looked to be in a bit of a hurry. 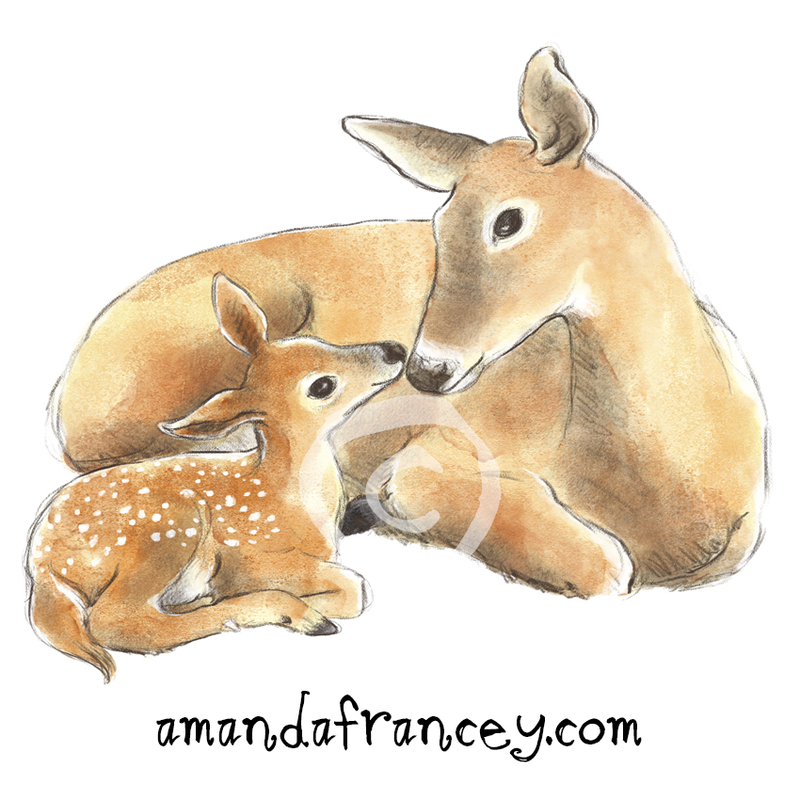 Luckily, I had some good wifi and could use Google images for reference so I could continue drawing this gorgeous mother and baby. I took some photos of the purple lupines for reference while I was there. I’ll share the finished illustration, including the background, when I find some time between other projects. If you're ever over that way, make sure you stay in this awesome house! Plus Geoff, the manager of this AirBnB, is incredibly helpful and he’s a fabulous storyteller. 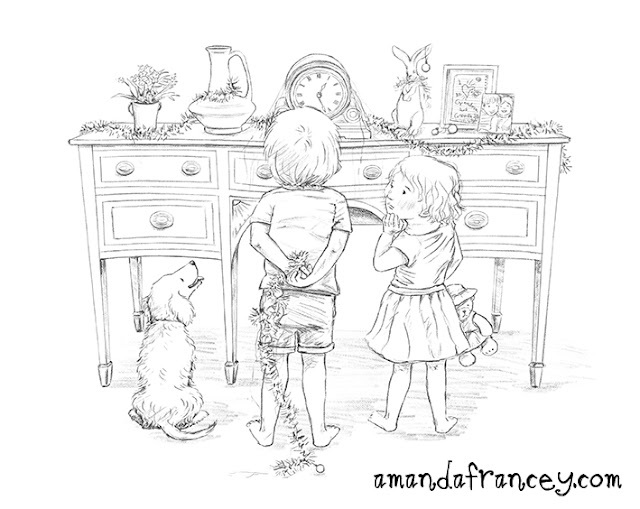 So make sure you ask him to tell you a story! We had so many other wonderful experiences while we were away, but I won't bore you with the details. Mostly we travelled around Canada and spent time in Boston and New York. Here are a few watercolour and pencil sketches from my journey. A huge thunderstorm in Boston cooled us down after a 35 degree day. 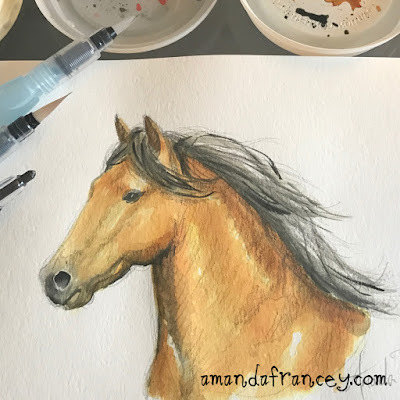 I drew a horse just because. Leaves from a Boston park. And of course, we had to visit as many bookshops as we could. I always make a mad run for the children’s section like an excited little kid! My tween–teenage children distance themselves from me. Australian picture books in a Canadian bookshop. 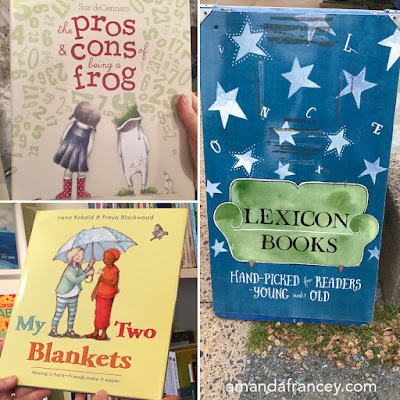 Australian picture books in a New York bookshop.